Back in October of 2013 I posted a video in which I played along with a MIDI version of the Genesis classic “In The Cage”. The original post is here. I wrote about my love of the band and some personal history, so I won’t clutter this post with a rehash. Tonight I was playing around with Cubase 7.5 and started diving into the new HALiotron engine in the HALion Sonic 2 VST virtual instrument. The presets leave a lot to be desired, which is often the case, but editing is very straightforward and the plug includes fairly standard Mellotron sounds including flutes, brass, bass clarinet, clarinet, strings, 8 voice choir, and bassoon. I hope they release an expansion pack with more sounds like the bass accordion, cello, violin, and viola samples. But the included samples are a good and popular starting point. I began with a blank program and loaded the string and brass samples into slots A and B respectively in the Tape Track selector switch. 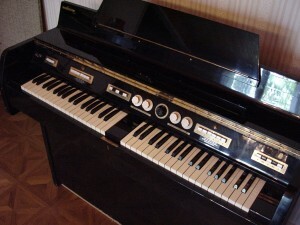 Like the original Mellotron Mk II you can position the switch in between selections and combine the sounds. This is how Tony Banks achieved the iconic timbre of his intro to “Watcher Of The Skies” with Genesis. He also used the bass accordion sound on the other keyboard (the Mellotron Mk II had two keyboards side by side). I added just a hint of reverb and then played the sound from my Minimoog Voyager acting as a MIDI controller. It makes a rather nice controller for such purposes due to the limited number of keys. The Mk II had two 35 note manuals. The Voyager has 44 keys. I was lazy and just recorded the sound coming from my speakers so what you’re hearing is from the iPhone’s internal microphone. But it still sounds pretty good. The HALiotron has some nice tonal shaping options including attack, decay, velocity as well as control over the filter. You can choose to loop the samples or play with the same 8 second limitation as the real thing. Overall, it’s a nice addition to the HALion VST and I’ve used it a few times already on my upcoming progressive rock album. Enjoy and please subscribe to my Youtube channel.